People repurpose old shipping containers for lots of things -- homes, restaurants, art galleries, even swimming pools. But Shawn Cooney may have found the greenest use yet -- literally. 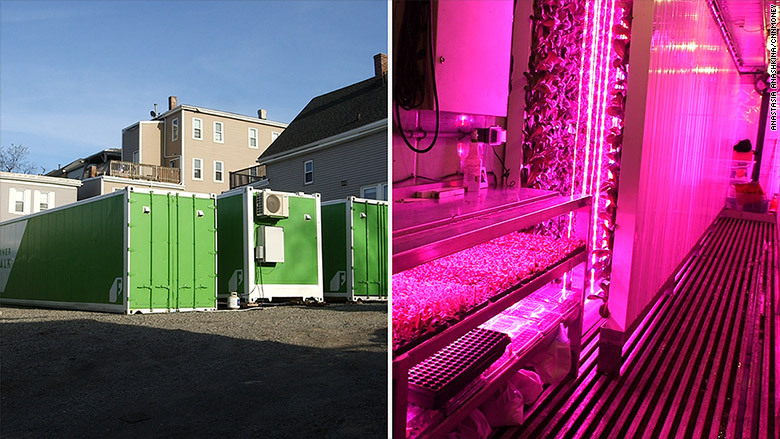 On a vacant lot near Boston's Logan Airport, Cooney is using four former freight containers -- plus one at another location -- to grow some 30,000 heads of lettuce, herbs and other leafy greens. "I'm not really a farmer," said the 61-year-old Cooney, who ran software companies before starting Corner Stalk farms in 2013. "But it's more interesting than a desk job." 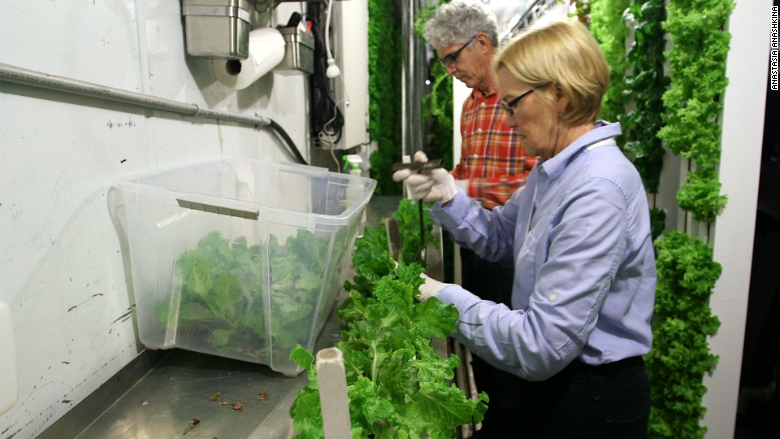 If 30,000 heads of lettuce sounds like a lot, it is -- and it's the reason why he's able to run a successful farm in one of the country's most expensive cities. 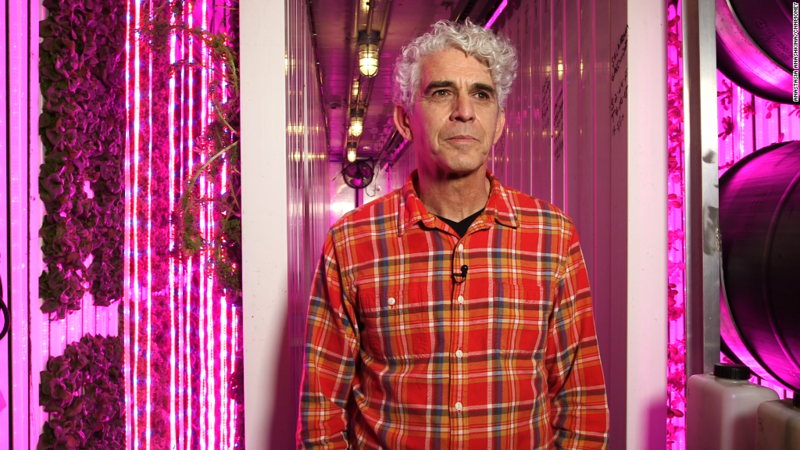 The containers come from Freight Farms, a Boston-based startup that outfits the boxes with lights, growing racks and irrigation systems -- creating what are essentially super efficient growing machines. Corner Stalk, outside and in. The boxes themselves are former freezer containers that were used to ship meat, so they're insulated against the heat and cold. Inside, the plants get light from LEDs and there's no soil. The roots are instead placed in a peat moss base that gets a dollop of nutrient-rich water every 12 minutes. The entire container, floor to ceiling, is filled with plants in a totally self-contained operation that eliminates the one variable that's vexed farmers since the dawn of agriculture: the weather. And it churns out the plants. Cooney said he harvests 4,000 to 6,000 plants a week -- roughly 80 times the number he'd get from a similar amount of space on a conventional farm. The plants are sold to a wholesaler, which distributes them to mostly high-end restaurants in the Boston area. "They have a little more taste, and definitely better texture," said Cooney. "Once a chef tries them, they want them." Shawn and his wife Connie harvesting plants. Harvesting and planting are the two main physical tasks in the farm -- everything else is automated. If the growing conditions are perfect for Cooney, the financing was nearly so. The containers usually cost $75,000 each, but as an early customer, Cooney got a deal. He paid $60,000 each -- or $300,000 total -- using a seven year, low interest, no money down loan from the Department of Agriculture. The loan is secured by the value of the equipment, though no doubt Cooney's track record helped him with the closing -- he had already started and sold three successful businesses. The operation brings in about $15,000 a month, and once he pays the loan, utilities, rent for the land, materials and salaries for himself and his wife, he's about breaking even. Profits should mount as he expands the wholesale business and opens a new retail store at Boston Public Market. When asked why he switched to farming from tech, he said he was tired of asking venture capital firms for money and liked the community he encountered in the food scene. Plus, his wife was interested. "She asked if we could do the farming thing together." he said. "And said it would be fun to do something way out of our comfort zone."